Next week, the Town of Coaldale is going to be a little bigger. 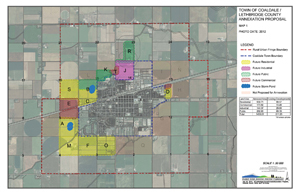 Earlier this month, Coaldale town council announced that the province has approved their annexation application. The annexation will become effective as of April 1, 2018, at which time the town will start providing services to the newly annexed area. The approval was granted in late February this year. The annexation project dating back to 2015, when the town and county first began discussing it and a growth study was initiated. When that was completed in 2016, the two municipalities began discussing more in depth over what land would be annexed, and in April 2017, the town sent in the application to the province. With the annexation set to come into effect on next month, the town has been given considerable room to expand. The news comes just in time, because the town is running out of places to expand. As of the 2016 census, Coaldale’s population stands at 8,215. With the town expected to double within roughly the next 25 years, Croil said they needed more land to accommodate the influx of people and jobs. The 25 years mark is a “conservative number”, as the province, through things such as the Southern Saskatchewan Regional Plan, is having municipalities to develop at higher densities — through measures such as smaller lots, secondary suites n family homes or promoting multi-family developments like townhouses — meaning Coaldale could see up to 35 years of growth from the annexed land instead. Currently, the town is about eight square kilometers. With the annexed land, it will increase to 14 square kilometers. Although the overall town boundary has increased, most of the additional land will be found on the west side of town. Croil says that although the newly annexed land will be used for different purposes, the town hopes to increase their non-residential tax base. In addition to residential and non-residential properties, some of the land will be earmarked for utilities, storm ponds and public space such as the new Malloy wetland.